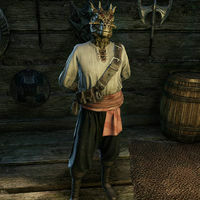 Steps-in-Alleys is an Argonian fence who runs Seal-the-Deal Fencing in the Outlaws Refuge in Vivec City. "I run a cleaning service of sorts. Most merchants don't like buying dirty goods." "What have you brought me today? Hopefully something of value." "I buy a very specific kind of goods. I'm sure a smart seller like you can figure out what." "I'm not picky about what you bring, or where you happened to pick it up. A sale is a sale to me."